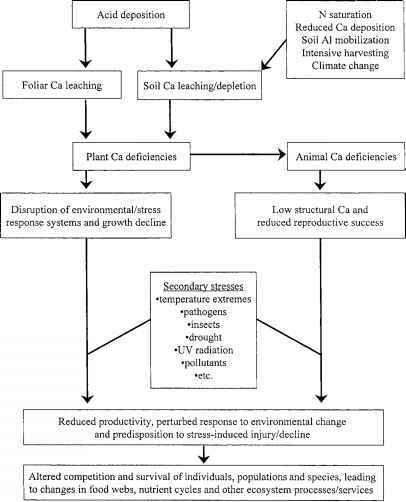 n annual increment (CAI), the volume of wood added in a year, increases for some years after planting and subsequently declines. 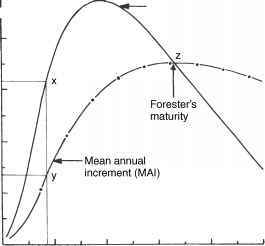 Forester's maturity is the time at which the forest stand has the maximum average rate of volume increment that can be achieved by a particular species on the site concerned. It is the point where the downward curve for CAI on a graph crosses that for mean annual increment (MAI) - the average rate of CAI from planting to a given point in time (see Fig. 10.3). In theory the maximum average rate of volume production could be permanently maintained by repeatedly felling the stand at forester's maturity and replanting with the same species. In practice yields sometimes fall gradually over a number of rotations as a result of soil deterioration, the build-up of pests and pathogens and other factors. Yield classes are based on maximum MAI, i.e. the maximum average rate of volume production per year reached by a particular species on a given site, irrespective of when this occurs. Under British conditions this may be as low as 4 m3 ha"1 for many hardwood, larch and pines, but exceed 30 m3 ha"1 for grand fir (Fig. 10.4). As yield classes represent the number of cubic metres (to the nearest even number) of timber produced per hectare at maximum MAI, yield class 12 includes any stand whose maximum MAI lies between 11 m3 ha"1 and 13 m3 ha 1. It takes longer to reach maximal MAI values in slower-growing stands as the yield class curves for oak demonstrate (Fig. 10.4). Though the maximum mean annual increments of different species may be of the same magnitude, they are often reached at quite different ages in the life of the tree, e.g. 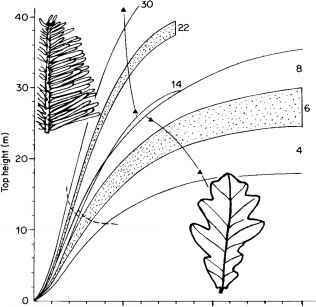 35-40 years for poplar Populus spp., 60 for Douglas fir Pseudotsuga menziesii and 80 for Norway spruce Picea abies (all trees in yield class 12 under British conditions). obtain the yield class of a stand by entering its top height in the appropriate year after planting. For example, in Fig. 10.4, oaks that have a top height of 20 m at age 60 would have a yield class of 6, that is, they have been adding an average of 6 cubic metres of wood per hectare each year. Tree spacing exerts a very important influence on the planting costs, weed control and the volume and quality ofwood obtained from a forest plantation. 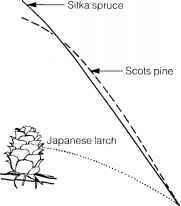 Many of the experiments conducted by the British Forestry Commission with Scots pine, Norway spruce Picea abies, Sitka spruce, European larch Larix decidua, Japanese larch L. kaempferi and Douglas fir Pseudotsuga menziesii to investigate this involved initial spacings of 0.9, 1.4, 1.8 or 2.4m (3, 4.5, 6 or 8 ft), both between and along the rows. The numbers of seedlings planted per hectare were 11 960, 5315, 2990 and 1682, respectively. 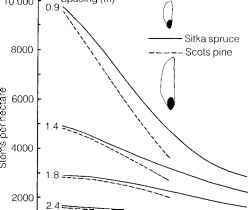 Closer spacing caused competition to begin earlier and for mortality prior to the thinning stage to be much greater. Species in the trials varied slightly, but some 90% of the seedlings in the 2.4 m spacing plots survived to the 10 m top height stage, whereas almost half of those in the 0.9 m plots were dead when survivors reached this height (Fig. 10.5). Weeds, however, were suppressed earlier, as the canopy closes much more rapidly when the trees are planted close together. Although the trunks of trees planted at wider spacing grow to a greater diameter than those planted close together, the taper rate in the lower parts of their stems is much greater leading to more waste when cutting timber from the logs. Greater volumes of wood are formed in a stand when trees are planted close together (Fig. 10.6), and this also reduces branching from the lower parts of the trunks which accordingly yield timber with fewer knots. The amounts of additional timber obtained by growing trees at closer spacings than 2.4 m, are not so great if a 7 cm dbh limit is applied to exclude stems that are not of 'merchantable quality', i.e. not suitable for saw mills. This material, however, can sometimes be sold for rustic work in gardens so may itself be quite valuable. The basal area of a tree is the overbark cross-sectional area of the trunk 1.3 m above ground. Like total volume, basal areas per hectare are considerably greater when trees are closely spaced. Forest mensuration, the measurement of standing and felled timber, is very important when timber is being bought and sold (Hamilton, 1985). The sizes and shapes of trunks and major limbs strongly influence the value of a given volume of timber. Wide trunks with low taper produce the largest area of usable planks per unit volume of uncut wood. Isolated trees frequently have a form unsuited to economic conversion to sawn timber. They are likely to be highly tapered and, as in European oaks, can have major limbs that spread out widely from less than three metres above the ground. The poet Longfellow who sat his village blacksmith 'under a spreading chestnut tree' knew what he was talking about. Species such as western red cedar Thuja plicata sometimes have major limbs bowing down and rooting in the soil. Commercial foresters are making every effort to improve the efficiency of their industry. Improved tree genotypes, sometimes involving polyploids (having multiple sets of chromosomes) and hybrids, are constantly coming into general use, and every effort is made to reduce volume losses caused by pests and disease. Fertilizer additions can be important in improving productivity in plantations (see Section 8.6.2). On a world basis nitrogen and phosphorus are most commonly supplied by foresters, though potassium additions have proved useful in Europe. In North America nitrogen is far more important in limiting tree growth than any other element (partly due to lower rates of nitrogen pollution - see Section 11.4.3), but the requirements of different species vary greatly. Basswood (American lime) Tilia americana, white ash Fraxinus americana and the tulip tree Liriodendron tulipifera in eastern North America are at an advantage on soils with abundant nitrogen, whereas species such as red and white oak (Quercus rubra and Q. alba), red maple Acer rubrum and aspen Populus tremuloides, compete well on sites with low nitrogen status. Engelmann spruce Picea engelmannii responds vigorously to ammonium nitrogen but not to nitrate. In the UK and much of continental Europe phosphate additions are often helpful; here much soil nitrogen originates through the fixation of atmospheric nitrogen. Fertilizer additions influence the forest ecosystem as a whole, often causing understorey plants and 'weed trees' to grow so much more vigorously that the application of herbicides or mechanical weeding become necessary. Patterns of disease in forest trees, the development of mycorrhizas and insect populations may also be affected in complex ways. In young stands the resultant increase in leaf biomass, and thus of water transpiration, may be great enough to reduce run-off into streams significantly. The term eutrophication is often used to describe the enrichment of both the soil and of the aquatic systems associated with the forest, in whose waters primary production may be increased. What is a yield class assessment?